Simply extending lifespan is not enough. We need treatments that boost resilience to multiple age-related diseases, argue Ilaria Bellantuono and 12 co-signatories. Ilaria Bellantuono is a professor at the MRC–Arthritis Research UK Centre for Integrated research into Musculoskeletal Ageing, University of Sheffield, UK. By 2050, the number of people over 60 years old is expected to reach 2 billion worldwide, or 22% of the population. In 2015, it was 12% of the population. And for many, a longer life will mean more years of chronic diseases, such as arthritis, type 2 diabetes, cancer and Alzheimer’s disease. 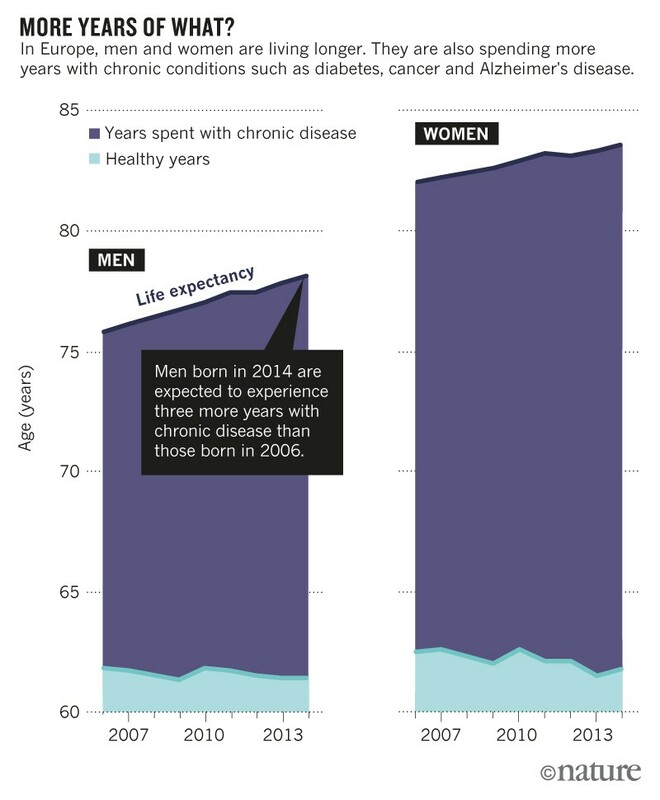 In Europe, for example, the estimated life expectancy for women born in 2014 is 1.6 years longer than for those born in 2006; for men, it is 2.3 years longer. But the women born in 2014 can expect 0.7 fewer years of good health, and the men zero (see ‘More years of what?’). As this trend continues, health-care and other costs are expected to soar. A class of drugs called geroprotectors might be able to delay the onset of concurrent age-related diseases (multimorbidity) and boost resilience. In various animal models, these drugs can ward off problems of the heart, muscles, immune system and more. And in 2014, investigators reported the results of the first clinical trial of a geroprotector in people over 65: the drug, RAD001, boosted immune responses to an influenza vaccine1. More than 200 compounds have now been classified as geroprotectors. But various factors are preventing these drugs from reaching the clinic. Here we set out three steps required to speed up translation. These have been distilled over the past three years by a network of academic and industry scientists, clinicians and regulators called COST Action BM1402: MouseAGE. The network, which is funded by the European Union, has worked with other experts in these domains worldwide. Over the past decade, understanding of the physiological changes that occur as people age has improved a great deal. “Ageing per se is not a disease.” – Ilaria Bellantuono on why it’s difficult to develop anti-ageing drugs. Common mechanisms seem to underpin several age-related diseases, including diabetes, Parkinson’s disease and Alzheimer’s. A review of more than 400 studies of people and animal models indicates that similar mechanisms underlie six conditions2. These can involve DNA damage, such as that caused by free radicals; cellular senescence (in which cells stop dividing and start secreting inflammatory factors); or inflammation and autophagy (the degradation of organelles, misfolded proteins and so on)2. This may explain why people over 65 are at a higher risk than younger people of developing more than one disease at the same time. In the United States, 7 out of 10 people over 65 with diabetes will die of heart disease, for instance. It is also becoming clear that one age-related disease can accelerate the onset of others. A 2014 study3 showed that people older than 75 who already had diabetes, say, were more than twice as likely to develop another disease over the next three years than those who were healthy at the beginning of the study. Also, between one-quarter and half of people over the age of 80 become frail. The accumulation of deficits makes it harder for them to recover from an infection, fall or other minor stressor4. It is unclear whether multimorbidity leads to frailty or vice versa, or whether they are independent. Until now, ageing research has focused mainly on single diseases, or on delaying death. 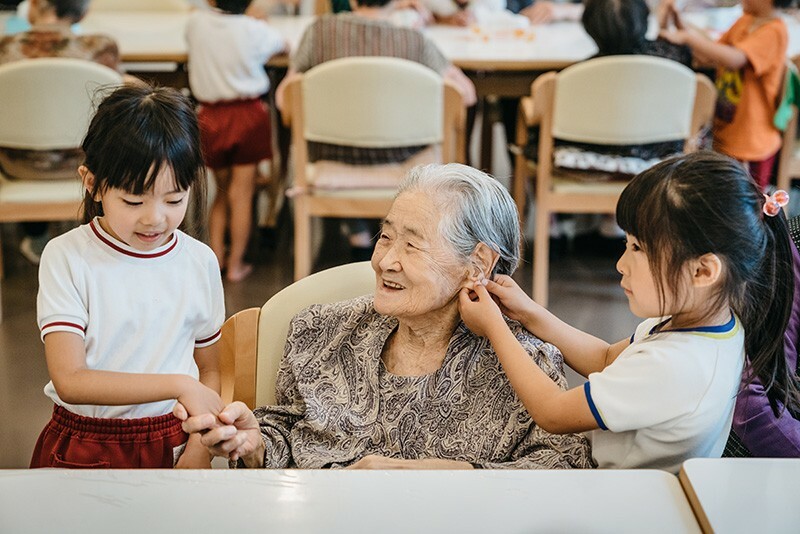 This means that the fundamental mechanisms of ageing as targets for the treatment or prevention of several age-related conditions are being missed. What’s more, patients with multimorbidity are being exposed to many drugs at once, often with adverse effects5. If these are to become useful in people, three advances must be made. There is no standardized definition of multimorbidity. Some researchers use the term to describe the co-occurrence of 2 diseases, some 5, others 13 and so on. This makes it hard to compare studies and to establish which diseases have a higher chance of occurring together. Agreeing to a definition will require: working out which of the 5 or 10 most burdensome age-related diseases, say, to prioritize; which of these are most likely to associate together; the timing of development of each disease with respect to the others in the cluster; and the identification of the pathways associated with their common pathogenesis. Likewise, there is no consensus on the definition of frailty, although clinicians and researchers are generally in agreement about its usefulness as a clinical term. Nor are there standardized assessments of frailty. Some describe a person as frail if they show three or more of the following: weakness, slowness, low levels of physical activity, self-reported exhaustion and unintentional weight loss. A more quantitative approach attempts to capture the accumulation of deficits (including hearing loss, low mood and dementia) in a ‘frailty index’9,10. Over the past three years or so, at least six major international societies have held meetings to try to encourage scientists and clinicians to reach a consensus on the definition of frailty11. These have involved the International Association of Gerontology and Geriatrics and the International Academy of Nutrition and Aging, among others. Such efforts should be scaled up and accelerated with the leadership of a coordinating body such as the WHO, the US Food and Drug Administration (FDA) or the European Medicines Agency (EMA). Improve animal models. There are many mouse models for type 2 diabetes, Alzheimer’s disease, stroke, cardiovascular diseases, osteoarthritis and osteoporosis12. However, to save costs and time, the desired pathology is generally induced when lab mice are 2 to 6 months old. (The average lifespan for the most commonly used lab mouse is 22 months.) Researchers might delete a key gene, for instance, or remove a particular organ (such as the ovaries) to induce a disease (such as osteoporosis). This means that the effects of cellular ageing on disease progression are rarely taken into account. We urge investigators to develop mouse models in which diseases are induced in aged animals. Some researchers have proposed models of multimorbidity that use certain strains in which the ageing process is accelerated. Mice that have had the DNA-damage-repair gene Ercc1 deleted, for example, develop dysfunction in multiple tissues.13 Again, we recommend that such phenotypes are induced in older mice. So far, the few attempts that have been made to develop mice models for age-related multimorbidity have met many challenges; in some cases, genetic alterations expected to worsen conditions have improved them. It could be that researchers need to delete multiple genes, with one gene — or several genes — linked to each specific disease. Ultimately, other species, such as dogs or baboons, might provide better models for multimorbidity. Even if the creation of mouse models for age-related multimorbidity proves too difficult, mice could still be used in initial testing, to confirm how a candidate geroprotector works, to observe the effect of a drug on tissue dysfunction and to study individual diseases in isolation. It might be easier, however, to establish good mouse models of frailty. The application of a frailty-assessment tool that considers 31 parameters, from grip strength to body weight (but not cognition) showed in 2014 that C57BL/6J mice develop mild frailty with age14. To develop models of more severe frailty, we recommend that, just as with morbidity, researchers characterize transgenic mouse models of premature ageing. As well as strains in which Ercc1 is deleted, investigators could study mouse models of genetic disorders that result in premature ageing, such as for Werner syndrome or Hutchinson–Gilford syndrome, but induce the gene deletion in animals that are older than 12 months. We also urge investigators to characterize models in which the fundamental mechanisms of ageing, such as inflammation or telomere maintenance, are disrupted. Certain telomerase-knockout mice that have critically short telomeres, for instance, develop multiple deficits by the time the mice reach 6–12 months old. In all such efforts, we encourage researchers to try to assess frailty in response to clinically relevant stressors, such as immobilization, surgery or the administration of chemotherapy or radiotherapy. Agree on desired metrics. Assessing geroprotectors in preclinical trials and in the clinic requires that investigators establish which attributes to measure in model organisms and in patients. We recommend that investigators focus first on how to assess drugs’ effects on frailty, which will enable the design of clinical trials that are short and cost-effective. We also urge researchers to prioritize measurements that signal a tangible benefit for patients, because this will facilitate the regulatory approval required to test geroprotectors in the clinic. For example, measuring a person’s ability to walk for 400 metres is preferable to measuring muscle mass because it improves her or his ability to live independently. Researchers should then identify the best correlates for these measurements in their study organisms. 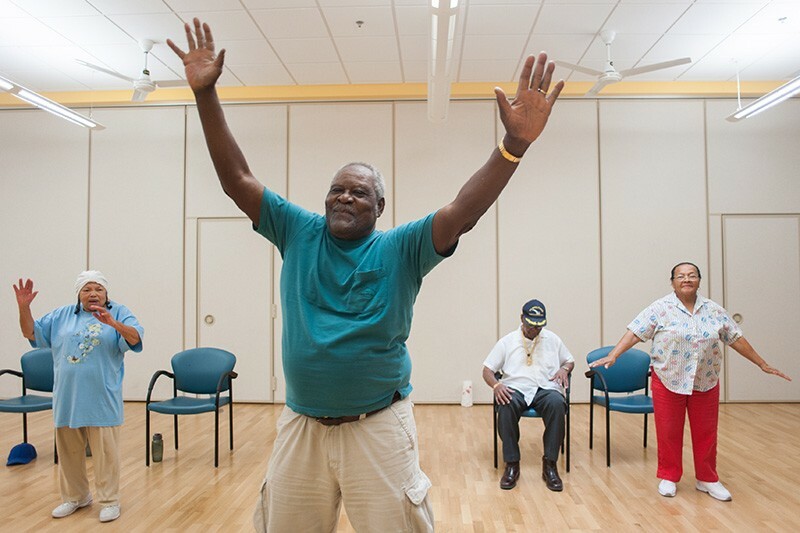 Various tools provide a starting point for monitoring resilience in frail elderly people. These include qualitative assessments obtained by asking individuals about their levels of fatigue, pain, weight loss and so on, or tests that monitor mobility such as gait speed or how long it takes a person to stand up and walk a certain distance. Regulatory authorities are especially likely to accept ‘improvement in mobility’ as a target. Mobility is a good predictor of disability, time spent in hospital, mortality and health-care expenditure15. It is easy to measure and its relationship to clinically meaningful change is well understood. We also advocate the development of better metrics of frailty in animals. Measurements that capture the health of the cardiovascular, cognitive, metabolic, neuromuscular and musculoskeletal, and immunological systems should be made, along with other assessments of weight loss, responses to stressors and endurance, for example. Genomics and proteomics could be used to identify biomarkers for monitoring the early effects of interventions. All these advances will require infrastructures that enable scientists to work collaboratively using standardized methodologies. An example of the kind of thing that’s needed is INFRAFRONTIER, an EU-funded research network of interconnected mouse clinics that has been developed over the past ten years for those working on mouse genomes. Proof-of-concept clinical studies could demonstrate the value of geroprotectors as boosters of resilience in frail patients within the next decade. In fact, we ask industry, academic scientists and regulatory bodies, such as the FDA and EMA, to work together to pursue preclinical testing and clinical trials in frail patients with conditions such as chronic obstructive pulmonary disease, hip fractures and cancer immediately — even before standardized definitions of frailty and multimorbidity are thrashed out. Instead of waiting ten years or so for multiple diseases to develop, researchers (using metrics such as mobility and time in hospital) might be able to demonstrate an effect within a few weeks. If successful, such studies could catalyse efforts to advance definitions, animal models and the characterization of measurable outcomes against which to test the drugs. Many factors have stopped discoveries about geroprotectors from changing patients’ lives. These include: the need for many stakeholders to work together; industry’s tendency to focus on the short term; and the way researchers’ performance is evaluated (numbers of papers published carries more weight than time spent helping the community establish definitions, for instance). With an ever-increasing ageing population, and the social and health-care systems of many nations close to crisis point, we must take a different approach. See Supplementary information for a full list of co-signatories. Mannick, J. B. et al. Sci. Transl Med. 6, 268ra179 (2014). Figueira, I. et al. Mech. Ageing Dev. 160, 69–92 (2016). Melis, R., Marengoni, A., Angleman, S. & Fratiglioni, L. PLoS ONE 9, e103120 (2014). Clegg, A., Young, J., Iliffe, S., Olde Rikkert, M. & Rockwood, K. Lancet 381, 752–762 (2013). Maher, R. L., Hanlon, J. & Hajjar, E. R. Expert Opin. Drug Saf. 13, 57–65 (2014). Zhu, Y. et al. Aging Cell 14, 644–658 (2015). Jeon, O. H. et al. Nature Med. 23, 775–781 (2017). Farr, J. N. et al. Nature Med. 23, 1072–1079 (2017). Mitnitski, A. B., Mogilner, A. J. & Rockwood, K. ScientificWorldJ. 1, 323–336 (2001). Fried, L. P. et al. J. Gerontol. A Biol. Sci. Med. Sci. 56, M146–M156 (2001). Morley, J. E. et al. J. Am. Med. Dir. Assoc. 14, 392–397 (2013). Drechsler, S. et al. Mech. Ageing Dev. 160, 54–68 (2016). Weeda, G. et al. Curr. Biol. 7, 427–439 (1997). Whitehead, J. C. et al. J. Gerontol. A Biol. Sci. Med. Sci. 69, 621–632 (2014). Cummings, S. R., Studenski, S. & Ferrucci, L. J. Am. Med. Assoc. 311, 2061–2062 (2014).